You'll be disco dancing the night away in style when you wear this fabulous 1970s inspired disco diva fancy dress costume. The funky costume comprises of a halter neck one piece silver cat suit decorated in an awe inspiring monogram pattern and beautifully finished with cool ruffled flared bottoms. 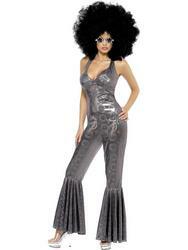 Simply glam the costume up with a wig or a pair of glasses and you'll look like the hottest diva on the dancefloor. Perfect for making a big impression at any fancy dress party.